Fontainbleau, the famous French royal residence, was the site of great artistic activity in the mid-sixteenth century during the rule of Francis I. 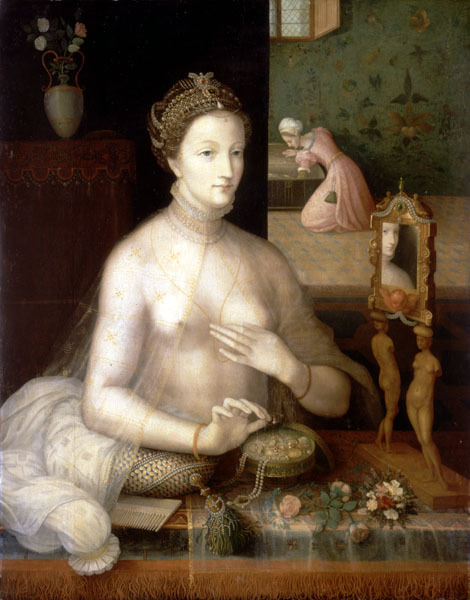 Developed at this court and nearly unique to it was the concept of a boudoir portrait, depicting the sitter in intimate circumstances. The Worcester panel has been connected specifically with François Clouet (about 1510-72), who served as court painter at Fontainbleau under both Francis I and Charles IV. Clouet was greatly influenced by Italian Mannerist portraiture with its emphasis on refined elegance and a great clarity and precision of draftsmanship. The subject of this work- identified variously as Diane de Poitiers, Mary, Queen of Scots, and other figures of royalty- remains unconfirmed. Several variants of this composition exist, supporting the theory that a famous prototype must have been their common inspiration.